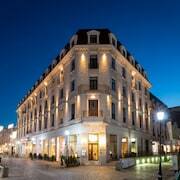 This family-friendly Bucharest hotel is within 1 mi (2 km) of Palace of the Parliament and Romanian National Opera. Stayed one night. About 10mins walk from airport. Shuttle bus available in the morning. Good breakfast options. Room fairly comfortable with Nespresso style machine. Large bathroom. A great central location for Old Town. Clean, efficient and modern. The facilities were great and the breakfast was perfect! Where to find Bucharest hotels near an airport? How can I find hotels in different Bucharest neighborhoods? Where can I find hotels in Bucharest that are near tourist attractions? If you're searching for great lodgings in Bucharest, you'll find options aplenty! You'll find 134 long- and short-stay options within a 0.1-kilometre (0.06-mile) radius of downtown Bucharest on our comprehensive accommodation pages. Those looking for a hotel conveniently located to the center of Bucharest, should check out the latest offers at the Grand Pier Business Center and Hotel Cismigiu. Sector 1 is a great district in which to base yourself as it offers 65 accommodation options. Sector 1 is 8 kilometres (5 miles) from downtown Bucharest. 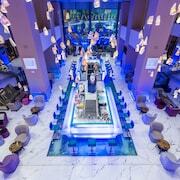 Places to stay include the Radisson BLU Bucharest and Grand Hotel Continental. An alternative hotel district is Sector 2 , around 5 kilometres (3 miles) from downtown. Sector 2 has 20 hotels, including the Hemingway Residence and Hotel Caro Golf. Other hotel areas are Otopeni and Snagov. The angelo by Vienna House Bucharest and RIN Airport are in Otopeni, while Snagov is where you'll find the Hotel Snagov Club and VILA 23 by ZEUS INTERNATIONAL. 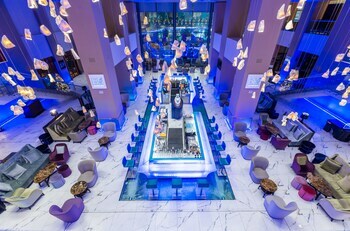 The Rembrandt Hotel and Europa Royale Bucharest are in Lipscani, while Hotel International Bucharest and DoubleTree by Hilton Bucharest - Unirii Square are part of the Sector 3 area. 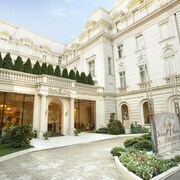 Hotels that are nearby to the Romanian Athenaeum include the Carol Parc Hotel and the JW Marriott Bucharest Grand Hotel. The Athenee Palace Hilton Bucharest and Crowne Plaza Hotel Bucharest are situated within comfortable strolling distance from the Arcul de Triumf. The National Museum of Art of Romania, another well-known Bucharest attraction, is walking distance from the InterContinental Bucharest and also the Epoque Hotel. 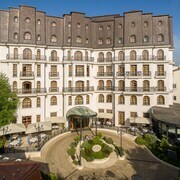 Accommodations that are close to the Museum of the Romanian Peasant include the Sheraton Bucharest Hotel as well as the Scala Boutique Hotel. The Bucharest area features a number of budget accommodation options that will be sure to please even the thriftiest travelers. The Hotel Marshal is 1 kilometre (1 mile) from the heart of Bucharest, while the Hotel Venezia by ZEUS International is 1 kilometre (1 mile) away. The Volo Hotel and the NH Bucharest are some other lower-cost accommodations that you could look into. The Alexander Hotel is positioned 7 kilometres (4 miles) away from downtown Bucharest. Another alternative is the Premier Palace Hotel & Spa, which can be found 5 kilometres (3 miles) away. Other Expedia-listed accommodation options include the Orhideea Residence & Spa and the Monte Carlo Palace Apart Hotel. The nearest accommodations in Romania include Parliament and Piata Unirii. Parliament is 1 kilometre (1 mile) to the west of Bucharest, while Piata Unirii is 0.4 kilometres (0.2 miles) to the east. Hotels and apartments in Parliament include the Novotel Bucharest City Centre and Siqua Hotel. The Marshal Garden Hotel and Capital Plaza Hotel are amongst the hotels in Piata Unirii. Henri Coanda International Airport is 16 kilometres (10 miles) away from Bucharest. If you choose to stay close by, can easily secure a night at the Charter Airport Hotel Bucharest or the Denisa Hotel Otopeni. What are the most popular Bucharest hotels? Are there hotels in other cities near Bucharest? What other types of accommodations are available in Bucharest? Explore Bucharest with Expedia.ca’s Travel Guides to find the best flights, cars, holiday packages and more!